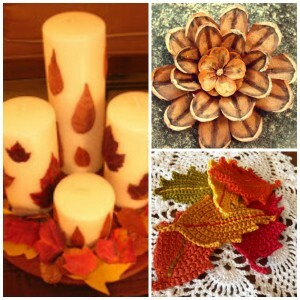 We’ve got thrifty ideas for fall on the brain, and these seasonal gems from our friends at AllFreeHolidayCrafts.com are just what the doctor ordered. From crazy cool crochet leaves to pine cone flowers and amazingly autumn candles, these fall ideas will save you a pretty penny while setting up your humble abode for the harvest season. 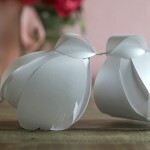 With the inexpensive craft supplies that we have to offer at CutRateCrafts.com, these ideas are practically free. These Quick and Cool Crochet Leaves are a great way to work on your favorite hobby during the fall season. 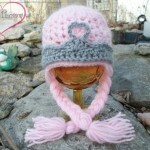 If you love to crochet, this is the perfect fall craft for you! Get ready to add some seasonal style to every table in the house. This easy crochet pattern can be made for less with our Super Value Solid Yarn, which comes in harvest orange and autumn red! 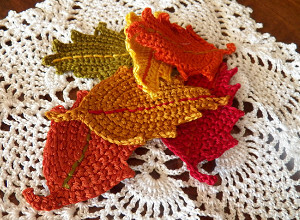 Use your crocheted leaves to dress up your autumn centerpiece or spruce up a few of your shelves around the house. You could also use a few of your leaves to dress up fall gift wraps, the possibilities are endless. These Pine Cone Flowers may be one of the most precious fall decorations you can make. This adorable little pine cone craft will have you smiling all season long. 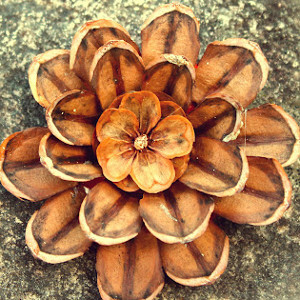 Create a simple flower pattern using pine cones you find outside. Just a little felt backing is all it takes to get this great design. This craft is definitely budget-friendly, and with our Feltables Craft Pack Felt Solid Piece you’ll be sure to save more than you can imagine! These Magical Fall Candles will have you swooning this season. This is a tutorial that will teach you how to decorate candles for autumn. 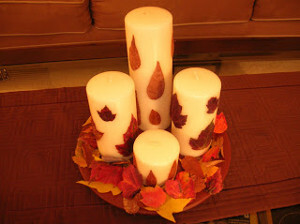 By simply gluing beautiful colored leaves to your candles, you will have created new fall decor. You can also try to Mod Podge the leaves to the candle. Either way they will be beautifully preserved. Pick up a set of our Paper Fall Oak Leaves to save even more on this inexpensive craft. By using materials you already have and these thrifty leaves, this project becomes practically free to make. Get started on your favorite seasonal craft today! There’s no better way to start off a new season than by saving some money on new home decorations! Which fall craft will you get started on first? CutRateCrafts has the largest selection of products in the largest variety of categories on the web. We are one of the largest retailer of craft supplies in North America. We comb the web to make sure our prices are the lowest anywhere. We are proud to help you save money on the products you want. Whether you are thinking about buying, or you have already made a purchase, our knowledgeable sales and service staff is only an email away. These Fall projects are all beautiful, I had to pin them !